At Samsung’s Unpacked event, the company confirmed what we already knew, and announced its Samsung Galaxy Note 9 phablet. It also announced a new wearable: The Samsung Galaxy Watch, the fourth device in Samsung’s line of wearable gadgets. With LTE connectivity, a slew of new health features, and three different colours, it seems Samsung is stuffing every feature it can find inside the thing. It’s a bit on the large side, however, though it does look like a fine piece of horology (as long as you plan on ditching the band). It’s water resistant (up to 165 feet deep) and has a high-resolution AMOLED touchscreen display coated in Corning Gorilla Glass DX+ designed to make wearable devices more scratch-resistant, something one might appreciate if they don’t want a watch that looks like it got into a fight with some steel wool after a few years. Right off the bat, the dimensions seem a little unwieldy. 42mm is the largest size offered by Apple for its Apple Watch. Large watches, obviously, fit larger wrists, and that spells a potential problem for women who (surprise!) also wear watches and often have smaller wrists. The 42mm version was on the very edge for me in terms of size, and the 46mm version looks comically large. 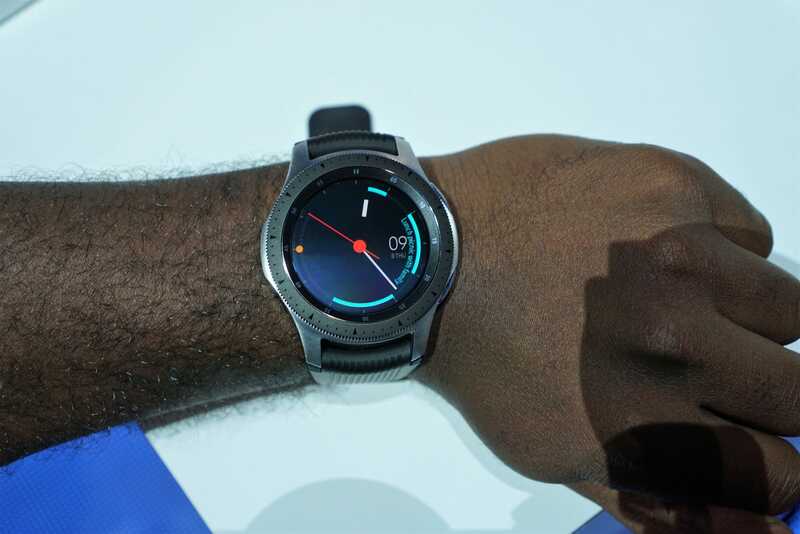 Samsung’s tactile dial, however, is one feature I very much enjoy, and interacting with the touchscreen showed off a pretty fast smartwatch, one that can pop between apps as fast as you can swipe through ‘em. It also has a rubbery watch band, though you’ll want to swap that out for a new one if you care even a little about style. The watch looks surprisingly similar to, well, an actual watch. The over 60 thousand watch faces available certainly don’t hurt, though its design has more in common with the Gear S3 line’s aesthetic than not. 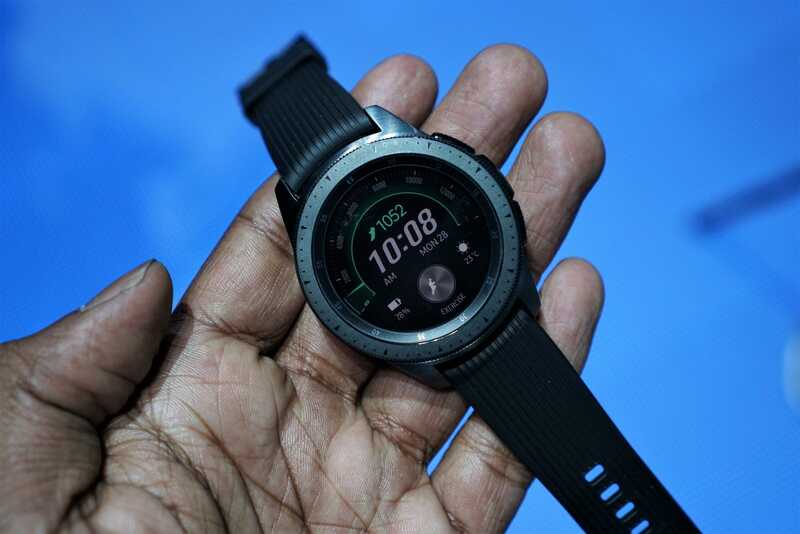 There are a bunch of new health-centric features in the Galaxy Watch, including reminders for Galaxy Watch wearers to breathe when it detects an elevated heart rate. The Galaxy Watch supports nearly 40 exercises, and can automatically detect a few automatically. There’s also sleep tracking, in case you love sleeping with your watch and tracking it all. The Galaxy Watch will be available in both Bluetooth-only and LTE-enabled variants. Better start your wrist exercises now so you’ll be beefy enough to pull the watch off.